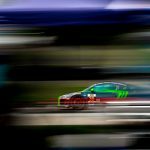 July 21st, 2018 was round 6 of the Imsa Continental Tire Sportscar Challenge hosted at Lime Rock Park, in Lakeville, CT. Limerock, known for its short, bull ring esque style of racing is infamous for high amounts of traffic, laps that are under 1:00 minute long, and pit stop strategy that Is crucial to a successful event. Being that the trip down pit lane to change drivers, tires and fuel takes roughly 50 seconds of transport, and 58 seconds of fuel, if you stop under green flag conditions you go 1 lap down to the leaders. Tyler McQuarrie and Jeff Westphal were in the Peregrine Racing/Carbahn Audi R8 GT4 for the 2-hour sprint race at the technical circuit in the mountains of Connecticut. “We are optimistic about our chances as we made a small improvement in rear tire wear over the 1 hour stint at the last race, which should theoretically help us here at Lime Rock which is famous for being hard on rear tires” The drivers explained. The #39 Black, Grey and Lime Green Audi qualified 5th, and spent the first hour of the race in the top 5, carrying good pace matching the leading machines. Roughly 46 minutes into the race, a yellow flag and safety car period came due to an incident on track, which proved to be a pivotal point for the Carbahn Peregrine squad. Most competitors came in to change drivers, tire and take a full tank of fuel which left everyone (but the Ford Mustangs) unable to finish the race in one stop, gambling on the fact that there would be another yellow to extend their fuel mileage, but finishing the race on 1 hour 15 minute old Tires. The Carbahn Audi gambled on the fact that there would be another, immediate caution following the restart of the race, which would open up the Audi’s fuel window (which was 15 minutes short of the first yellow) and potentially give them slightly better tires in the remaining minutes of the 2 hour race. However, the second yellow never came, and an extended pause to clean up debris put more cars in the window to not need a second stop. 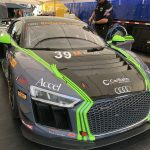 Unfortunately this meant that the 39 Audi, left on old tires was swamped by competitors with new tires behind, and with a stop under green with 50 minutes remaining, Westphal inherited the car from McQuarrie must further down the running order than the top 5. The #15 Ford was handed a penalty from the race director which was justification of fault however the Ford was also damaged and could not continue. The #39 Audi has been repaired and the team readies for round 7 of the Imsa Continental Sports Car Challenge at Road America in Elkhart Lake, Wisconsin in roughly 2 weeks time. Westphal, Mcquarrie and the team are looking forward to some on track retribution by way of finishing atop the heap of 26+ competitors.